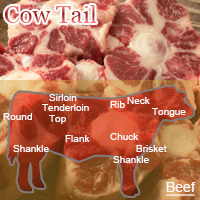 Cow tail contains more fat than beef ribs. It may not contain much protein but what protein it has is mostly made up of collagen and elastin. Using cow tail is popular in soup and curry. It gets most of its energy from fat containing a close to 10:1 ratio between fat and protein. The calories in Cow Tail per 100g(1cut ) is 492 calories. Cow Tail is calculated to be 492Cal per 100 grams making 80Cal equivalent to 16.26g with 47.1g of mostly fat、11.6g of protein、0g of carbohydrates in 100g while being rich in vitamins and minerals such as Vitamin B12 and Zinc.